Charles Henry was born in Batley on 21st February 1878 and baptised at Batley Parish Church on 26th May 1878, the son of John and Eliza Jane (nee Butterwood ) who was from South Elmsall. John from Ackworth was a painter and the family lived at Mount Pleasant, Purlwell. John Robert was born in 1882 but died in December 1888. In 1881 the family had moved to Brearley Street, Mount Pleasant and Alice Gertrude was a year old. By 1891 the family had moved to 10, Back Brearley Street and thirteen year old Charles was working at a spice works. Ten years later Charles Henry had become a house painter like his father, Alice was a carpet rug maker and the family had moved to 9, Brearley Street, Mount Pleasant. On the 29th April 1902 Charles Henry married Bertha Chambers from Rothwell Haigh at Dewsbury Registry Office. Harry was born later the same year. In 1911 the family was living at 5, Brearley Street in a two roomed home a few doors away from his parents who lived in a five roomed home at 1, Brearley Street, Batley. A further son, Willie was born on 31st March 1913. Charles worked as a painter and decorator for Messrs G. Tomlinson and Son, Upper Commercial Street, Batley for over 24 years. He was associated with St. Andrew’s Church, Purlwell. Charles enlisted on 11th August 1916 and disembarked in December 1916 in France. At first he was Private 34095 in the 10th KOYLI’s before transferring to the 2nd Battalion Rifle Brigade (Prince Consorts) at the beginning of May 1918. The 2nd Battalion came under the orders of 25th Brigade in 8th Division. In 1918 the battalion saw action at the Battles of St. Quentin and Rosieres and saw action at the Somme crossings and of Villers-Bretonneux which were all phases of the First Battles of the Somme 1918. The Battle of Aisne started on the 27th May and lasted until 6th June. A small and tired British force sent to Chemin des Dames in exchange for fresh French divisions that went north, was struck and virtually destroyed as part of another German offensive, Operation Blucher. He usually worked as a batman to an officer whose name his family thought was Ellis and went missing at the same time. A letter which was written on the 25th May indicated he was with his officer at a machine gun school but he was reported missing two days later as was the officer. He was thought to be Captain David Heaton-Ellis MC, of the 2nd Battalion, Rifle Brigade (Son of Vice Admiral Sir Edward Heaton-Ellis, K.B.E., and of Lady Heaton-Ellis, of “Le Prieur`e,” Mainville par Draveil, Seine-et-Oise, France. His brother, Sub-Lieut M. Heaton-Ellis, died 24th Jan 1919). He only came home on leave once during his time in France. His family did not receive official confirmation that he was missing until September 1919. He is Remembered with Honour at St. Andrew’s Purlwell and Batley War Memorial. 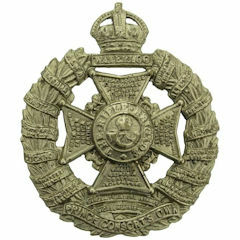 Charles Henry was awarded the British War Medal and the Victory Medal.